Which Electric Sports Car Is Right for You, Porsche or Tesla? We compare the Mission E and Tesla’s new Roadster. Electric vehicles (EVs) are no longer a niche interest. Some of the world’s biggest vehicle manufacturers are jumping on the bandwagon, anticipating that gas- and diesel-powered cars, semi trucks, and even luxury yachts will be a thing of the past in the not-too-distant future. Of course, long before all these manufacturers got in the EV game, Tesla was building a name in it, starting with an electric sports car: the Roadster. The car was one of the first examples of an electric car designed to sit comfortably alongside the MX-5s and the Testarossas of the world. Tesla produced the original Roadster between 2008 and 2012, but the company recently announced plans to start selling a new Roadster in 2020. A lot has changed since 2008, though, and Tesla is no longer the only company producing high-end electric vehicles. 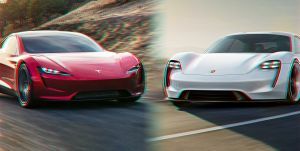 Porsche has plans to combine their legendary design sensibilities with environmentally conscious combustion via the Mission E. The company first unveiled this electric sports car in 2015, and the vehicle is expected to hit the market a year prior to the new Roadster. Here’s how the two luxury autos stack up. Porsche is cheaper, but let’s get one thing straight: neither of these vehicles is budget-friendly. The Porsche Mission E will run $85,000, which isn’t surprising given the brand’s luxury status. Meanwhile, the Tesla Roadster’s base price is a whopping $200,000. Tesla is on top. According to Porsche, the Mission E will be able to accelerate from 0 to 97 kmh (0 to 60 mph) in under 3.5 seconds. Tesla says that the new Roadster can manage 0 to 97 kmh (0 to 60 mph) in just 1.9 seconds, but Porsche isn’t impressed with this stat. Tesla goes further. On a full charge, Porsche estimates that the Mission E can travel around 482 kilometers (300 miles). That isn’t too shabby for an EV in general, but it’s well below the Roadster’s range, which Tesla promises will be 997 kilometers (620 miles). Porsche prevails, but this win comes with an asterisk. Tesla hasn’t released information about the Roadster’s charge time, but their 480-watt Supercharger stations need around 75 minutes to fully charge a Model S. Porsche is touting an 800-watt charging station that needs just 15 minutes to replenish the Mission E’s battery enough for the electric sports car to travel 250 miles. Porsche plans to install their 800-watt chargers at dealerships around the country, but they’ll need time for build a charging infrastructure that can match Tesla’s. In the interim, owners can charge their Mission Es at stations that uses a lower wattage, but that will take longer. Tesla wins this one, but we should note the Roadster in space is a 2008 version. Still, if the old model can handle a launch aboard a rocket, the new one should be able to, too. Until Porsche expands into off-world exploration, Musk has the German automaker beat with regard to sending cars into space.